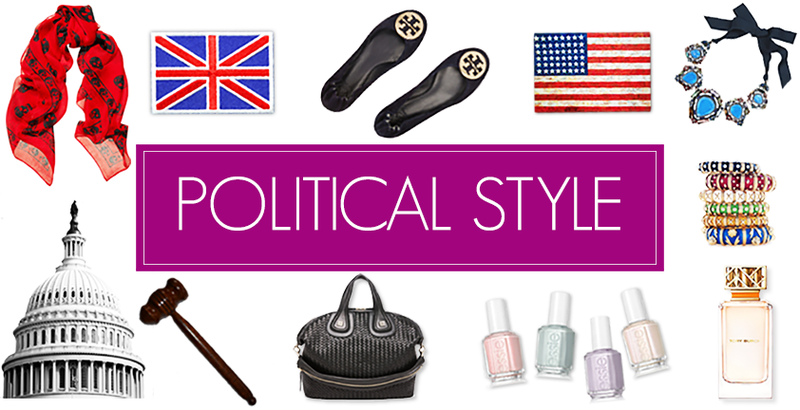 Another week has flown by! Here's a recap of the Prime Minister's week. 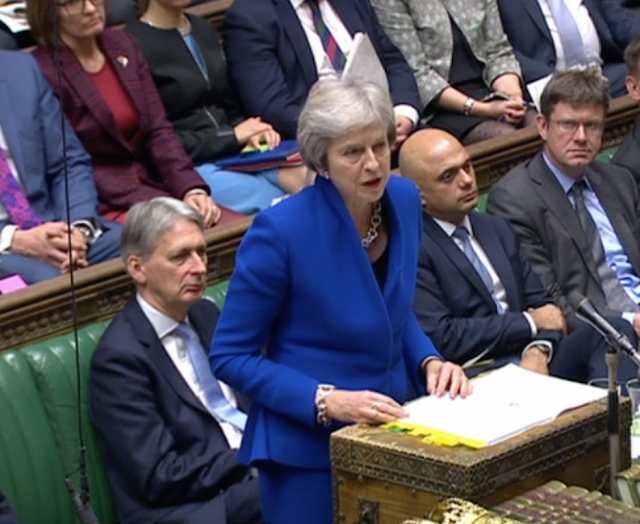 On Monday, the PM was in the House of Commons updating Members on the EU Council meeting. The PM wore her navy Herno blazer and trousers, accessorising with the silver Mirta Bijoux necklace and bracelet and the leopard Kitty heels from Charlotte Olympia. 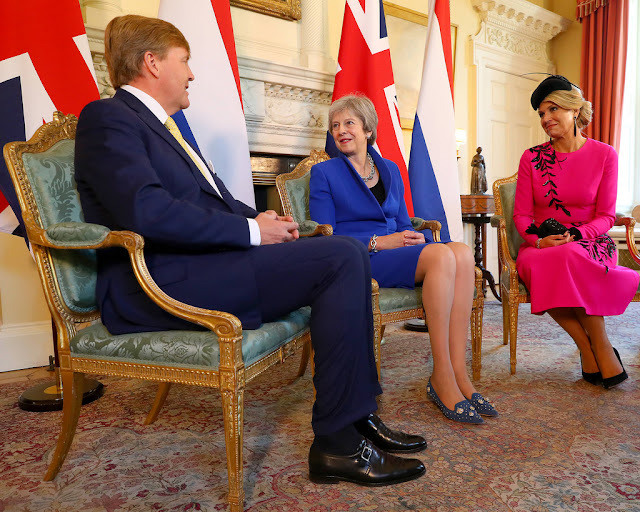 On Tuesday, May was part of the platform party to welcome the King and Queen of the Netherlands to the UK. 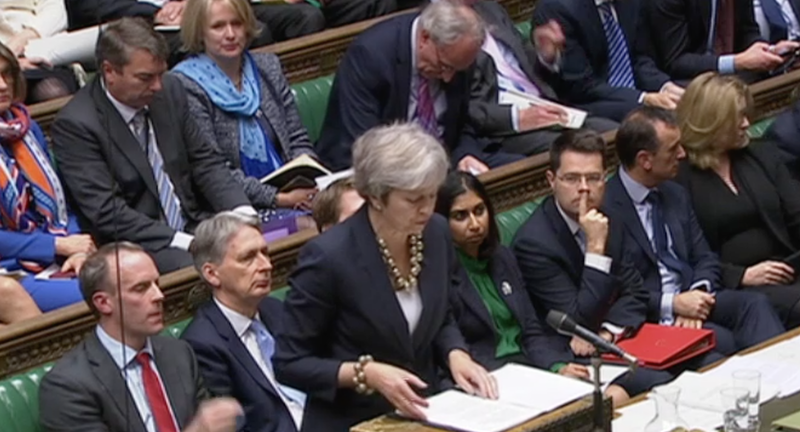 The PM wore our favourite navy spotted Daniel Blake jacket, teaming it with a skirt, navy hat from Liz Felix and the navy Twiggy heels from Russell & Bromley. And in the evening, the PM attended the State Dinner at Buckingham Palace. Debuting a new navy floor length dress with black embellished sleeve detailing, May boldly accessorised with the Audrey suede kitten heels from LK Bennett and the silver Valorie clutch from Anya Hindmarch. On Wednesday, the PM took part in the weekly Prime Minister's Questions session. It was another day for Daniel Blake, this time May opting for the bright blue Origami jacket and matching skirt. The glitzy (and very chic) Rosebud kitten heels from Russell & Bromley were her shoe of choice. And later in the day, the PM welcomed the King and Queen of the Netherlands to Number 10. This photo is iconic - and bright colours work so well against the black door! 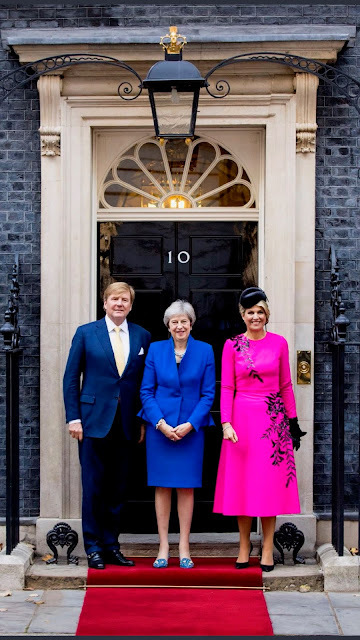 May also welcomed the Prime Minister of the Czech Republic to Number 10. Thursday saw the PM launch the annual Poppy Appeal. 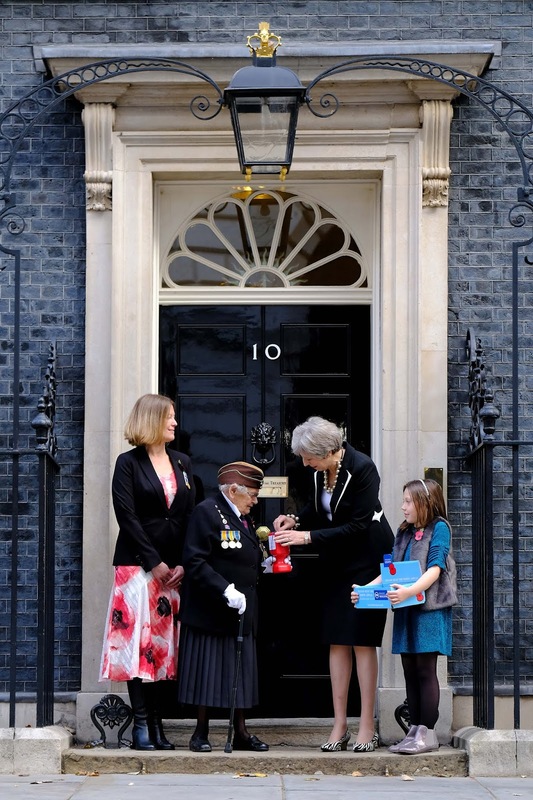 Theresa May bought her poppy on the doorstep of Number 10 Downing Street alongside Poppy Mitchell (R), Barbara Weatherill (L of PM) and Claire Rowcliffe (L). 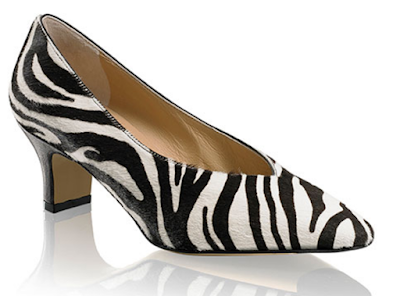 May wore her black and white Escada blazer with a black skirt, and debuted a new pair of shoes from Russell & Bromley - the very daring Starlet court in zebra print! 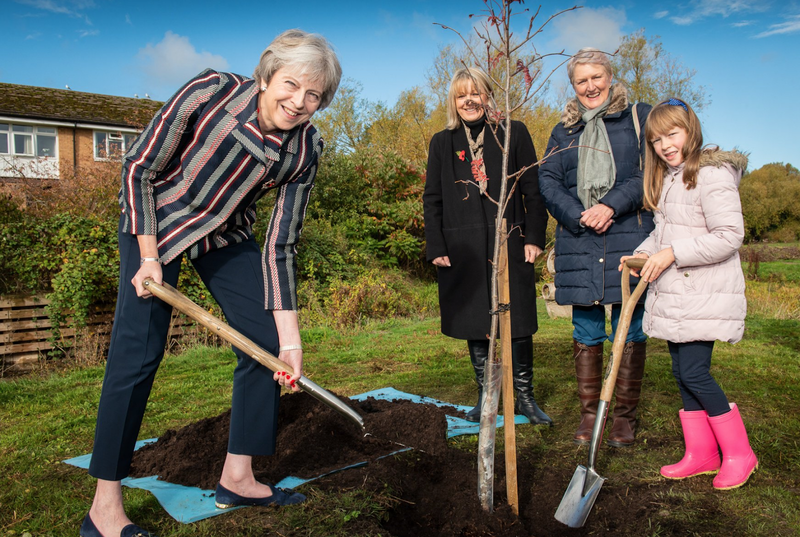 And on Friday, the PM was in her Maidenhead constituency where she planted a tree as part of the Queens Commonwealth Canopy. Looking bright in her striped jacket and the navy Cocktail Russell & Bromley loafers!